Trails close at sunset. Give yourself enough time to be back at your vehicle (or campsite if you're staying at one) before dark, or the rangers will fine you. Always visit the Castle Rock State Park websiteparks.ca.gov/?page_id=538 for fairly current official information. Concentrated area of good bouldering. Classics include Sharma Arete, Static Reach, Nature Nazi Boulder, Lost Keys Traverse, thee Classic, Asian Invasion, Right Hand Indian Man (not to be confused by "Right Hand Man"), and many others. Park in main area of Castle Rock. Follow obvious signage towards the north side of the road. "Approach time: 3 - 5 minutes. From the main Castle Rock parking lot, walk or drive east 150 yards to an opening on the opposite side of the street, which is the entrance to Sanborn-Skyline County Park. Mike A. bouldering at Indian Rock area. Anyone know that name for this boulder? It's directly uphill from the Nature Nazi Boulders. I had to clean off a lot of dirt, pine needles, and moss, but this has definitely been climbed. Two obvious lines, one up the middle to a large shelf and one on the arête. I added the problems under the Nature Nazi boulders, and referred to it as the Uphill Nature Boulder. 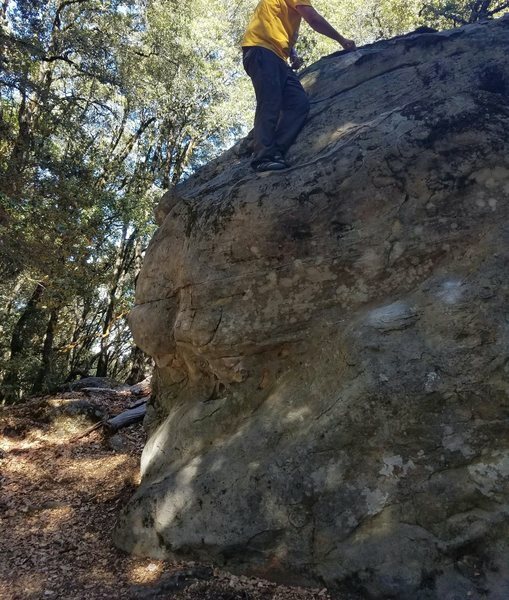 Please let me know if you have a name for the boulder or either of the problems, and I'll get it changed. Thanks!